When I’m nostalgic for Japan, there is one recipe I pull out. Though, oddly, I didn’t find it in Japan nor use it when I was there. 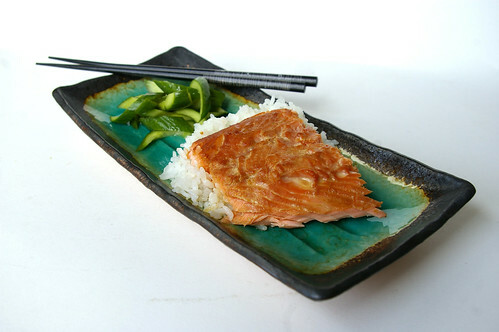 Instead, this recipe for Teriyaki Trout was one I inherited from my family, who has been cooking it for years. Although only really a nod to a traditional teriyaki, it is my fallback recipe when I’m longing for the Land of the Rising Sun. 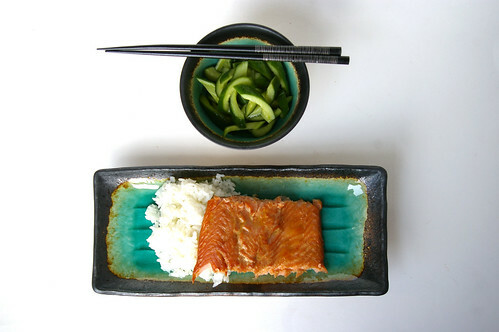 There, I often made an authentic teriyaki salmon that I would serve with steamed rice and a selection of tsukemono (pickles). This is not the thick gloppy sauce you find on supermarket shelves. 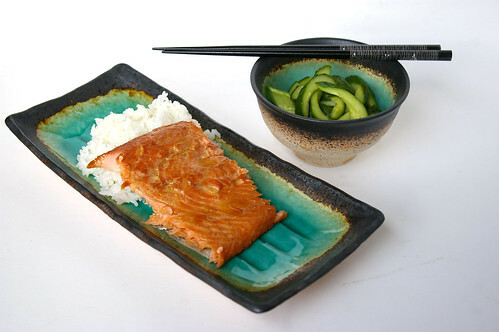 This is a thin marinade that infuses the fish with that salty-sweet teriyaki flavour. In the beginning, my parents made this with salmon, as the original recipe calls for, but when the price of that got too dear, they started using steelhead trout. Now that’s what I grab as well. My version is a photocopy of the original, with no notation of where it came from. Even the amount of fish called for is absent from the recipe. But I’ve found the marinade is enough for about two pounds of fish. I prefer to do whole sides rather than individual fillets or steaks, though please use what you want. Since it’s usually only me dining, I often make the full batch of marinade and divide it between two pieces of fish, throwing one into the freezer for dinner at a later date. I’ll pull it out in the morning and let it sit in the fridge. As it thaws, it continues to infuse the teriyaki flavour into the fish and by the time I get home from work, it’s ready to cook, which, some nights, is exactly the kind of meal I like to have around. When I’m a little homesick for the rice paddies and stunted hills of the small town in Japan where I lived, I make this dish, serving it with rice and some steamed green vegetables. Sometimes, when I’m really feeling nostalgic, I also make quick pickles -thin slices of de-seeded cucumbers left to sit in a bath of rice vinegar, sugar and salt. The tangy flavour is a nice balance to the rich fish. Combine the soy, sherry, sugar, garlic and ginger in a bag or flat dish. Add the trout. Let marinate for at least 30 minutes or up to overnight. Preheat oven to 450°F (230°C). Place fish in a casserole dish (if using steaks, grease the dish slightly so they can be easily removed) and bake until fish is cooked and flakes easily, about 12 to 20 minutes depending on the thickness of the fish. The amount of salt and sugar can be easily adjusted for taste. I use Maldon flaked sea salt, which has a milder flavour. Sea salt can be easily substituted, but start with just 1 tsp (5 mL) and add more only if needed. The rice vinegar should be unseasoned. 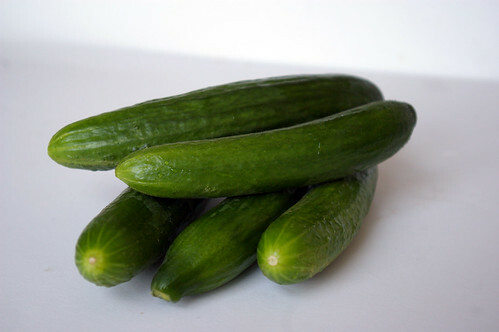 Slice cucumbers in half and use a small spoon to scrape out seeds. Slice on a diagonal into ½-cm half-moons. Stir together vinegar, sugar, salt and water and mix until salt and sugar have dissolved. 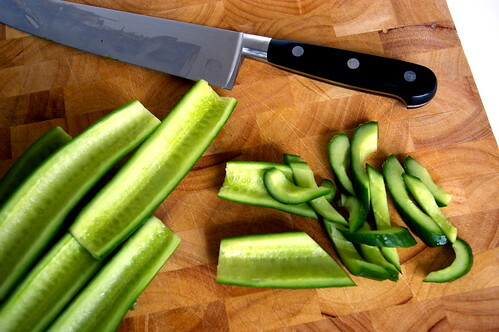 Add cucumber slices, tossing them with brine. Let rest in the fridge for at least an hour, tossing occasionally. This originally ran in the Calgary Herald. For more recipes and food stories, head to the Calgary Herald’s Food page. You ever notice how one recipe can beget another? It made me wonder why so few recipes I have stumbled across call for raw asparagus, which, when lightly dressed, is lovely. 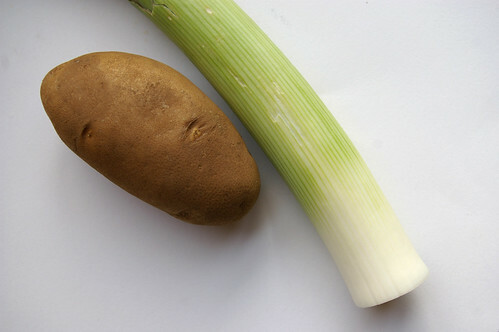 Now that the stalks are appearing again on grocery shelves, it got me thinking. 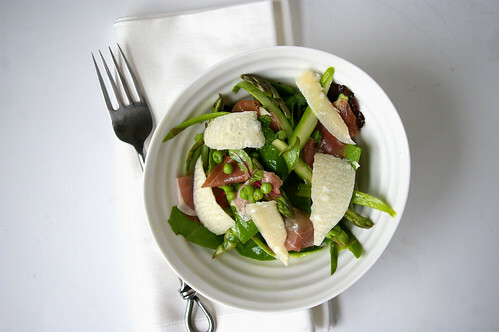 And then I stumbled across a salad recipe, which combined asparagus shavings with some other great loves of mine: Parmesan, prosciutto, mint and lemon. This salad is kind of like six degrees of separation. Mint goes well with peas, which are lovely with asparagus, a natural match to prosciutto. Well, really, what doesn’t prosciutto go well with? And a lemon-based dressing adds some refreshing tartness, while a little bit of honey brings out the natural sweetness of the peas. Now, I am the first one to up the amounts of salad goodies — more Parmesan, more prosciutto, please and thank you. But in this case, I’m going to, unexpectedly, advise restraint. Messing with the fine balance between salt and sweet, meat and cheese, mint and vegetables can upset the equilibrium. Too much cheese and the salt overpowers the delicate flavours of asparagus and mint. Too much prosciutto overwhelms the texture of the salad. When the proportions are right, this salad is perfection. 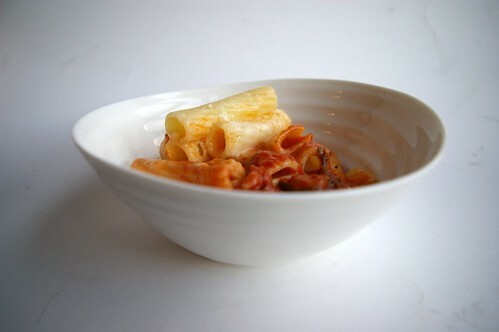 Right after finishing the photo shoot, I inhaled a bowlful. I loved the spring green flavour of the thinly shaved asparagus, the sweet peas and bright mint with the slight tang of the mustard and lemon dressing. The prosciutto didn’t hurt either. 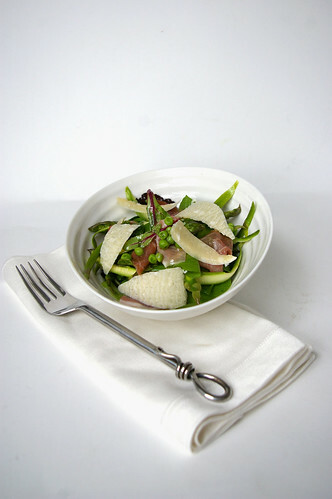 All the greens contrasted with the pink of cured ham and cream of Parmesan is quite pretty and makes this a great dish for entertaining. Serve it out on the deck with some crusty bread and a nice bottle of wine. This salad is from Epicurious by way of Serious Eats. If fresh peas are in season, feel free to use them instead of frozen peas. Frozen peas are perfectly tasty, though. Just defrost in a sieve with some hot water. 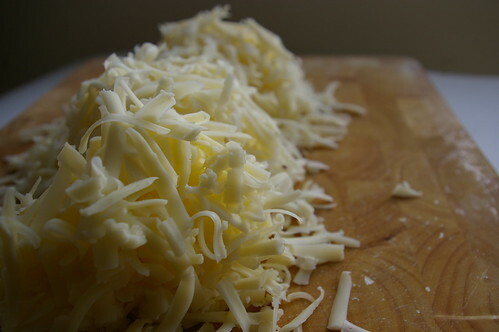 To get nice Parmesan shavings, let the cheese sit out on the counter for 10 or 15 minutes and then use a vegetable peeler. Whisk together lemon juice, Dijon mustard, honey and salt and pepper. Drizzle in the oil slowly while still whisking to emulsify the dressing. Test the dressing and adjust seasonings as necessary. Place salad greens in a large bowl, add chopped mint and peas. After shaving, you will be left holding the rough end, which can be discarded. Repeat with all the asparagus and then add the shavings to the salad. Add sliced prosciutto. Toss with dressing (start with only a portion of the dressing and add more as necessary; the salad may not need all of it). This first appeared in the Calgary Herald. For more recipes and instructional videos, check out the Herald’s Food page. I had never tried Korean food before I moved to Calgary. There had been Thai and Vietnamese, Japanese and Chinese, of course. But in all my opportunities to eat Asian food, there had been no kimchee or bulgogi. 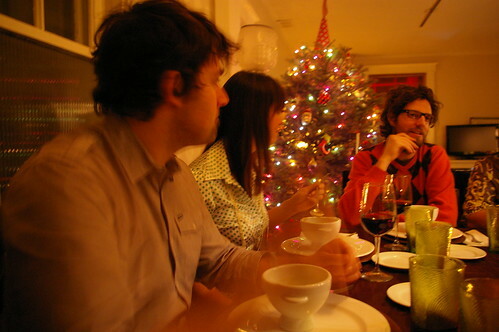 And then a group of friends formed an ad hoc supper club where we would all go out for dinner on Thursday nights, typically for ethnic foods. We dined on Indian and pho and then, finally, a Korean place where I had my first taste of beef bulgogi. I went back a couple of months later and there was only one thing on the menu I wanted. Later, I stumbled on a recipe in my oft-thumbed Everyday Food cookbook (Clarkson Potter, March 2007) for a version of beef bulgogi. Instead of the more traditional Korean short ribs, it called for thinly sliced rib-eye and it required no ingredients more exotic than sesame and chili oils and some staples found in most kitchens: brown sugar, soy, ginger, garlic. Craving the taste again of that distinct mix of salty soy, garlic and the hint of sweet from the brown sugar, I thought it was worth a try. The book now cracks open to that page, left slightly spattered by being set too close to the fry pan when cooking — the sign of a successful recipe. But I also like the idea of rolling up the beef and onions and peppers in soft butter lettuce, so this time around I did exactly that. 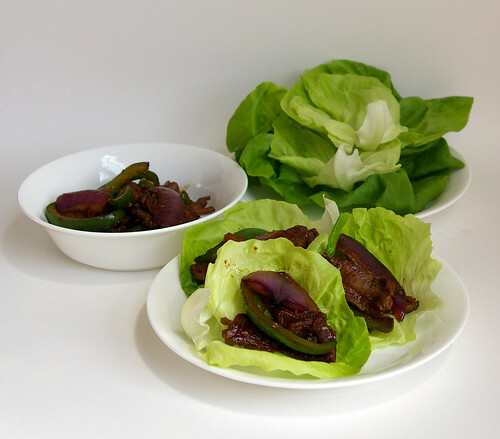 The leaves of butter lettuce (or Boston lettuce, as it is also known) are tender and pliable, making them a perfect container for the bulgogi mixture. 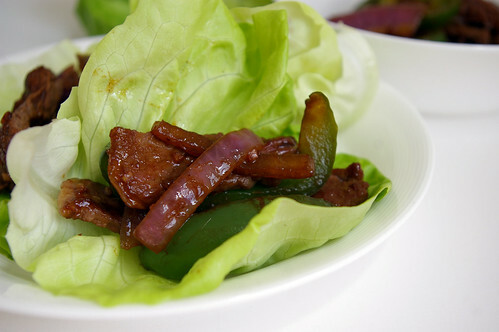 The thin leaves also don’t interfere with the flavours and softness of the meat. Either way, it’s a delicious and fast way to taste Korea. And one I’ll come back to again and again. This recipe from Everyday Food calls for hot chili sesame oil, which I have never found in my grocery store travels. Instead, I use half sesame oil and half chili oil. In a pinch, you can use all sesame oil and a dash of red pepper flakes. 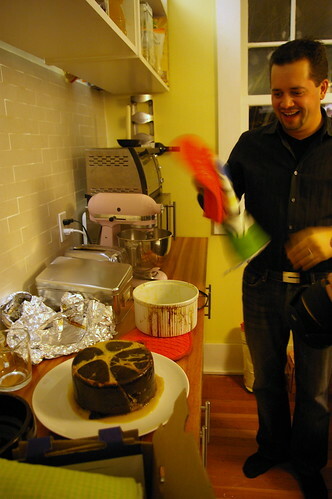 Freeze the beef for 20 minutes; transfer to a clean work surface. Slice diagonally (across the grain) into 1/8-inch (3-mm) thick strips. Heat 2 tsp (10 mL) of the vegetable oil in a large non-stick skillet over medium-high heat. Add the onions and peppers; cook until softened, about 5 minutes. Transfer to a plate. Wipe the skillet clean with a paper towel. Heat the remaining 2 tsp (10 mL) vegetable oil over high heat. Cook half the meat, turning often, until browned, about 2 minutes. Transfer to a plate. Cook the remaining meat. Return the first batch and any accumulated juices to the pan; add the onion mixture. Cook, tossing, until heated through, about 1 minute. 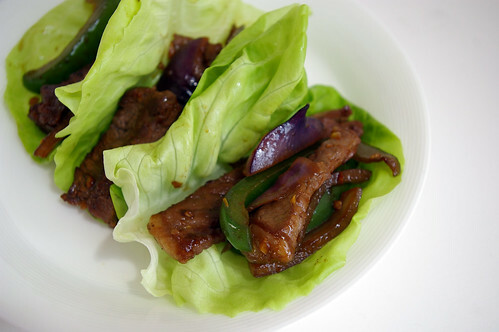 To serve, roll up the beef mixture in lettuce leaves. This first ran in the Calgary Herald. For more recipes and food stories, check out www.CalgaryHerald.com/life. I bought a few peaches from the farmer’s market a few weeks ago, thinking they would be a great and simple addition to bagged lunches for work. And when they were perfectly ripe, they were fantastic. 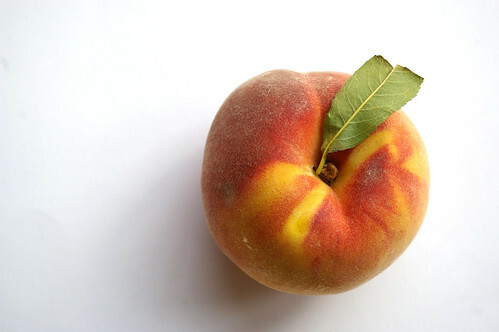 Sweet and juicy and just oh-so-peachy tasting. Then I got home from work one night and just wanted a salad. But, you know, not just a salad. And then a brainwave: what if I took the final sweet peach and combined it with some goat cheese, prosciutto and pecans. Good god, that was a fine salad. Dressed in a light vinaigrette made with blood orange vinegar. I ate it with a few pieces of crusty baguette and it was a fantastic dinner. It should come as no surprise that I made it again a week later when I had another group of peaches ripe and at hand. But later, I thought I would like to try combining the bread and the salad by creating a flatbread that used the peach-prosciutto-goat cheese combination. This time with a little rosemary added in. Is it cheating if I used some pizza dough I bought at the local Italian market? I’m going to say no. I can make dough, but when you’re at the market anyway and they have perfectly risen balls of dough for a little more than a toonie, I figure there’s no harm in taking shortcuts once in a while. Got home, stretched it out on a baking sheet covered in a thin layer of olive oil and then just topped it with slices of peach, chopped rosemary, some ragged pieces of torn prosciutto and blobs of goat cheese. Into the oven and baked until golden, which took probably only 10 to 15 minutes, and it was good to eat. It was delicious, though next time I may omit the goat cheese which, frankly, felt a bit like gilding the lily. So this is less a recipe as much as a suggestion but one worth trying. Set oven to 500F. Stretch out dough on lightly oiled baking sheet. 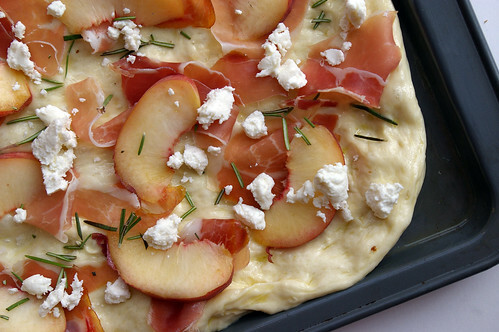 Top with sliced peaches, prosciutto, rosemary and goat cheese. Bake until dough is golden, about 10 to 15 minutes. I have a confession: I am incapable of kneading. I don’t know if it’s a character defect, a lack of practice or sheer laziness, but I cannot seem to take a mix of flour and water and yeast and make it into a smooth mass that balloons into a beautiful ball of dough. I end up with something shaggy and ragged and, well, downright ugly. When it comes to pizza crusts, I have tried to persevere. There have been a few successes (and one colossal failure where I essentially made a giant, pizza-sized cracker), but I was typically undone by my less-than-stellar kneading skills. And then, a revelation: no-knead pizza dough. It was a circuitous route that brought me to a place where I realized I too could easily make homemade pizza dough. 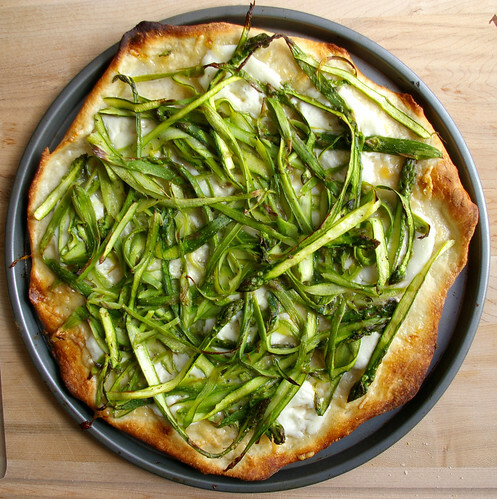 It started with shaved asparagus pizza. I stumbled onto the idea on Smitten Kitchen — a popular food blog written by the charming Deb Perelman — and was immediately enchanted. 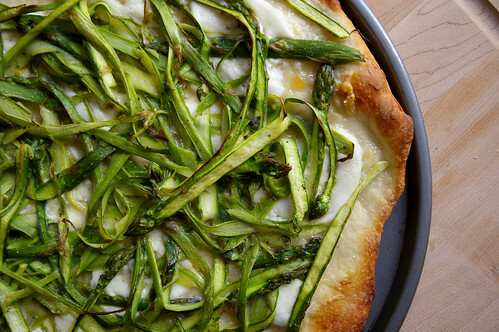 Warm chewy crust, melted cheese and thin shavings of asparagus that would roast on top? Yes, please. But, as Perelman pointed out, she was not the only one to think this would be a fantastic combination. Indeed, Jim Lahey, who revolutionized bread baking with his no-knead concept, serves a high-end version at his restaurant. Surely, Lahey must have a pizza dough recipe. Yes, yes he does. And it doesn’t involve kneading. This time, the dough is intentionally shaggy and ugly. And, after a few stirs and some squishing together of the ingredients (I can’t even bring myself to call it kneading), it only wants to be left alone for two hours. When finally baked, it has a pleasing crispness with just an appropriate amount of chew. Topped with a tangle of shaved asparagus that had roasted and intensified in flavour, along with the richness and slight salt of the cheese, this is something I could eat over and over. 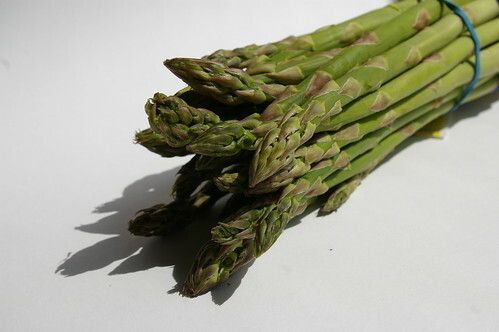 My first taste of asparagus came in Grade 10 when my boyfriend made me dinner one night and steamed some to go with steaks. I don’t remember much about that meal other than feeling overwhelmingly shy and excited to have a boy I liked cook for me. Since then, I’ve grown to love the green-stalked vegetable and I’ll take it just about any way it can be prepared. Roasting, though, is my favourite because I like how it slightly caramelizes the tops and intensifies the flavour. 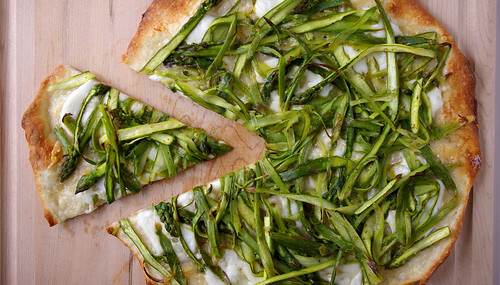 This pizza takes advantage of that, particularly because you shave the asparagus. None of the stalks shave perfectly, so you end up with varying thicknesses of asparagus strips, each of which cook slightly differently. Some will caramelize, while others will still retain a slight bite to them. 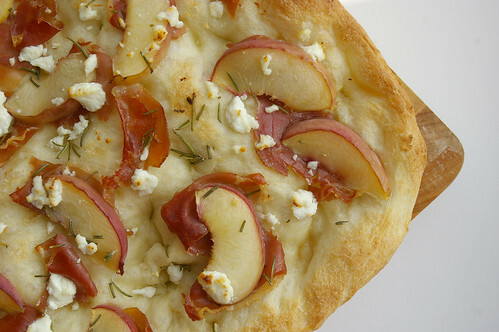 The beauty of pizza is that it is infinitely adaptable and this recipe is no exception. 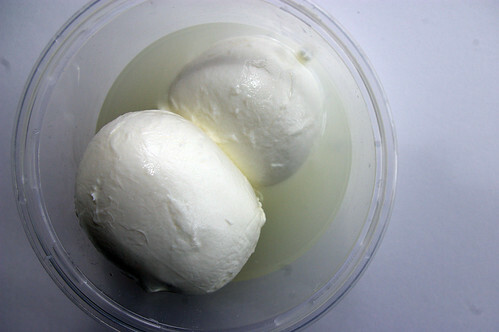 While I used buffalo mozzarella cut into rounds and a sprinkle of Parmesan, I was tempted to throw on some bits of goat cheese as well and will probably try that next time. A squeeze of lemon would have been nice at the very end. Like it spicy? Toss on some red pepper flakes. Lahey’s version uses some rather fancy cheese, quail eggs and shaved black truffles. But even with slightly less-glamorous ingredients, this dish is delicious. P.S. This crust was so good that I made another batch about four days later. Yes, I have a pizza problem. In a medium bowl, stir together the flour, yeast, salt and sugar. Add the water and, using a wooden spoon or your hand, mix until blended, at least 30 seconds. Cover the bowl and let sit at room temperature until the dough has more than doubled in volume, about two hours. Using a bowl scraper or rubber spatula, remove the dough from the bowl onto a floured work surface. Gently form into a rough ball. Then divide the dough into two halves (to make his two 13×18 – 33×45 cm – pizzas or, do as I did, and divide into three parts for round pizzas) spacing them 4 inches (10 cm) apart, and cover with a moistened kitchen towel for 30 minutes. 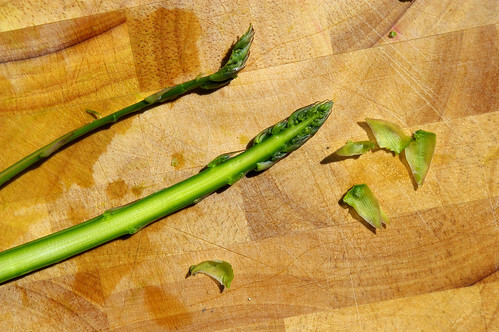 Using the rough end as a handle, hold the asparagus against a cutting board and use a vegetable peeler to make long strips. (I got anywhere between two to five shavings from each stalk depending on how thick they were or how easily the peeler went through the asparagus. They were also of varying thicknesses, which is fine.) After shaving, you should just be left holding the rough end, which can be discarded. Repeat with all of the asparagus. 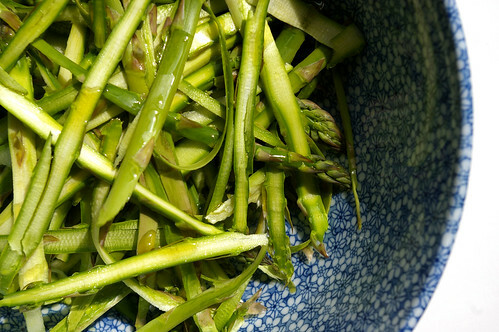 In a bowl, toss together asparagus, olive oil, salt and pepper. Roll out or stretch dough to create 12” (30 cm) round. (Lahey calls for it to be stretched by hand, but I used a rolling pin and did only a bit of hand stretching after getting the dough on the pan.) Brush olive oil on pan and transfer dough. Sprinkle on Parmesan, then add mozzarella. Top with asparagus strands. 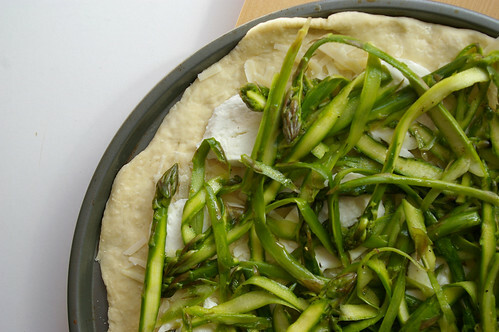 Bake for 10 to 15 minutes until crust is golden, cheese is melted and asparagus is roasted. This story first appeared in the Real Life section in the Calgary Herald. 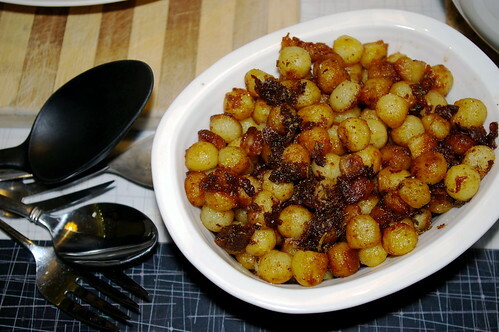 For more delicious recipes, visit CalgaryHerald.com/life. And now, back to the article. I have an unabashed love of tomatoes. Meaty slices of them wedged between two pieces of buttered toast with a sprinkle of salt and pepper is my idea of comfort food. 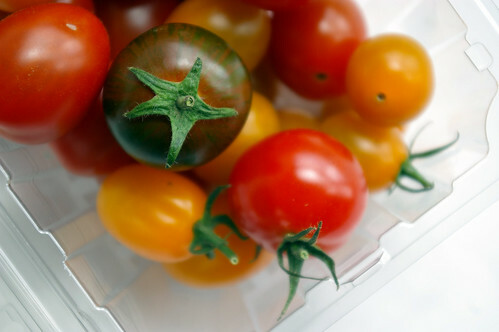 Roma tomatoes drizzled with a little balsamic vinegar and good olive oil make a simple side dish. And I love that burst of seeds and flavour that comes when biting into a plain cherry tomato. I once bought a perfume called Tomato because it smelled like the aroma given off after brushing up against the green stalks of a tomato plant — that verdant scent of heat and summer. A few spritzes on my wrist could transport me back to being a kid and visiting my grandparents on one of the Gulf Islands where I sometimes helped in the garden. Enclosed in chicken wire to protect it from ravenous deer, the garden produced sweet tiny carrots I ate straight from the ground after a quick rinse from the hose, grape vines that tangled their way along trellises, and rows of tomato plants. I would use a plastic watering can to fill the coffee tins with water, from which my grandfather had removed the bottoms, nestled into the earth next to the plants — a trick that allowed the water to get right at the plant’s roots. And I would brush up against the stalks, filling the air with that distinct smell. If any were ripe, I’d pull them sun-warmed from the dark green plants and eat them unadorned. There is no taste like a vine-ripened tomato. But sometimes I like to roast them to intensify their essence and bring out more of their natural sweetness. 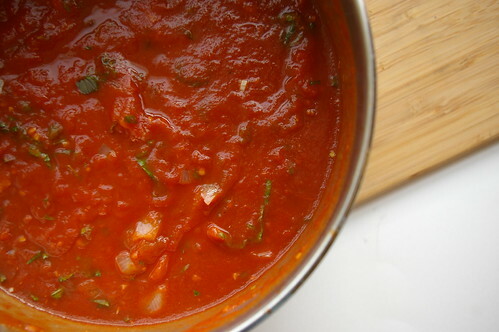 Baking halved Roma tomatoes in the oven with a few unpeeled garlic cloves is an excellent base for a good tomato soup. 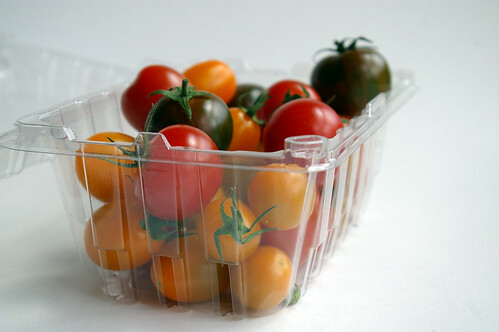 Cherry tomatoes, when roasted, shrink and wrinkle to softish pouches of concentrated tomato flavour. I’ve made simple pasta sauces like this, topped only with shaved Parmesan and a sprinkle of basil or parsley if I have them lying around. 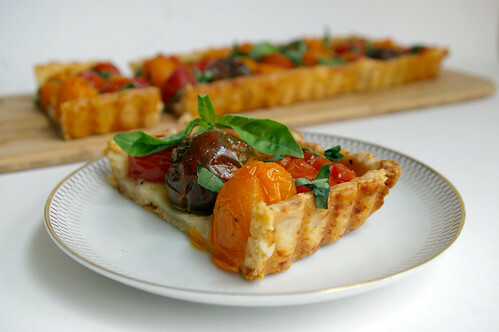 I thought recently — after seeing a clamshell package of multicoloured cherry tomatoes at the farmers market — that they would make a good savoury tart, particularly if paired with a hearty crust. 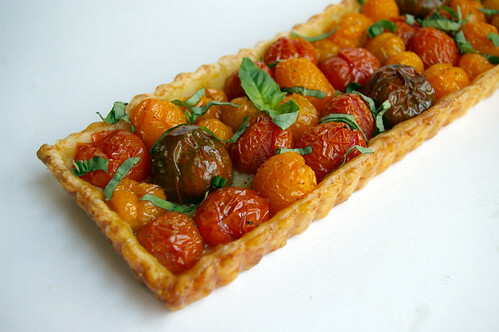 When I began imagining a roasted cherry tomato tart, I thought there was potential in adding a few handfuls of Parmesan cheese to the dough to bring out a nice nutty, rich taste when baked. A little research led me to realize I wasn’t the first person to think of this, but I didn’t love any of the recipes I came across. I am by no means a pastry expert, but was willing to give myself a chance to experiment. Using ideas from several different recipes, I decided to create a hybrid pastry that used cream instead of water and a cup of Parmesan cheese, finely grated and blitzed with the other ingredients in the food processor. The dough was easy to work with and resulted in a golden crust that played nicely against the sweet, soft tomatoes. 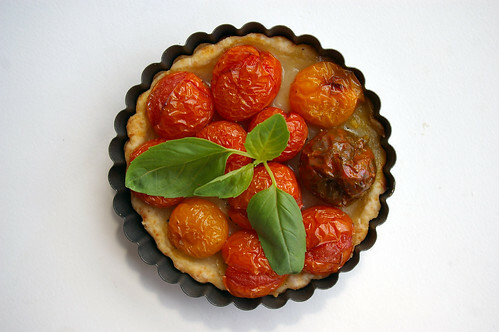 Because cherry tomatoes are so juicy, there was a lot of liquid bubbling away as the tart was baking. (Truth be told, I was a bit nervous about just how much I could see as I peered through the oven door.) Some of it did cook off in the process, but there was definitely a thin layer of tomato liquor when I pulled the tart out. Some may call it soggy; I prefer to think of it as tomato-infused pastry. Either way, the base of the tart pastry was crisp and I liked the taste of it. Add the flour and pinch of salt to the bowl of a food processor, then sprinkle the butter cubes on top. Pulse two or three times until the butter starts to break down, then add the Parmesan. Pulse until the mixture is crumbly and the butter is in pieces no larger than a pea. Empty the contents onto a lightly floured surface and knead it a few times to pull the dough together. 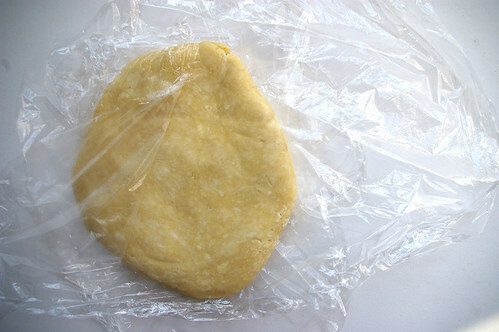 Wrap in plastic and refrigerate for at least 30 minutes or as long as overnight. 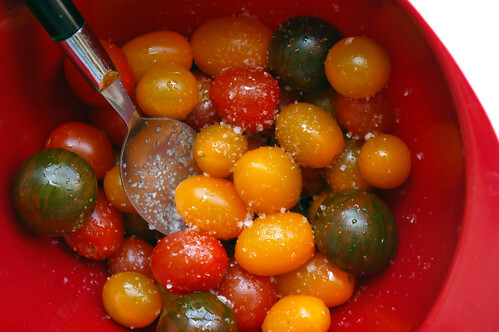 Toss the tomatoes in a bowl with the olive oil, 1 tsp salt and pepper. Set aside. On a lightly floured surface, roll out the dough until it is about 1/3 inch to 1/4 inch (8 millimetres to 6 mm) thick. 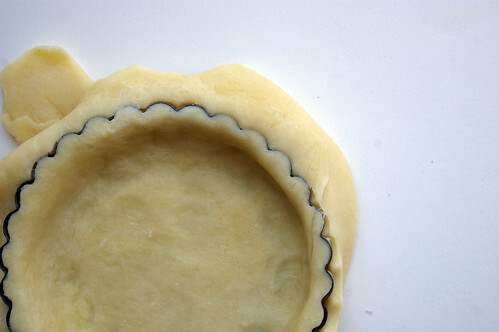 Press into tart tin (9 inch/23 cm round tin or a 14-inch/35 cm rectangular tin), stretching it as little as possible, and cut off excess. 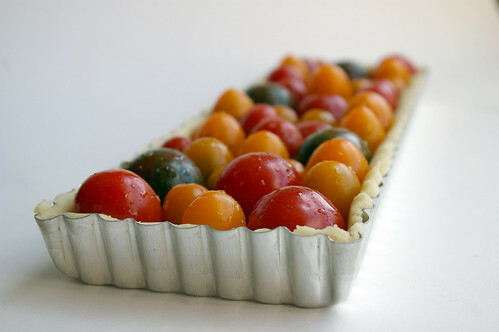 Arrange tomatoes in the tart tin. 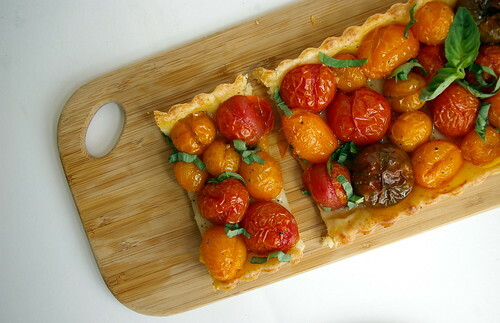 Bake for an hour until tomatoes are soft and pastry is golden brown. Remove and let cool on a rack for 10 minutes. Roll basil leaves like a cigar and then slice them to make herb strips. Sprinkle over tart. 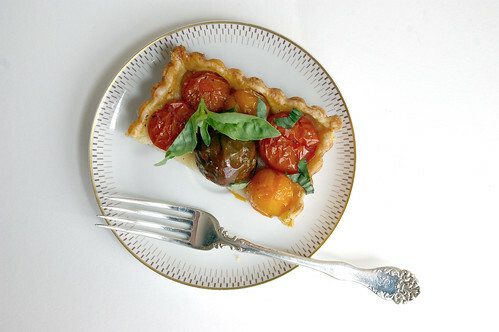 Cook’s note: The amount of tomatoes will vary depending on how tall or fat they are and how well they fit together in the tart tin. This is one of my favourite all-time childhood meals. I loved coming home to find a pot of Mac-Raff n’ Cheese bubbling away in the oven. My stepdad, Sean, would make it in our giant Corning Vision Ware pot (Do you guys remember those? The glass pots that came in a couple of colours? Ours was brown. 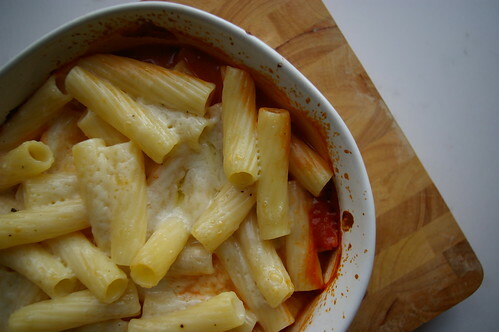 ), so if I peered through the oven door I could see the tomato sauce simmering up to mingle with the cheese-coated pasta. For a long time I thought it was a creation of Sean’s, him being the head chef in our blended family. And what a chef he was! We were well-fed kids because that man knows his way around a kitchen. Lamb and mint sauce, chicken and rice with cream gravy, roast beef with all the fixings. There’s a reason I love to go home, even today. But when I was home a few months ago, my mum revealed that she was actually the mastermind behind the recipe. She’s a Macdonald; he’s a Rafferty. So we were the Mac-Raff household. Hence the name of this dish. It is a smart meal from a parent’s perspective. Quick, filling and can be assembled during the day and left at the ready to bake closer to dinner time when everyone is home and getting hungry. As an adult, I’ve also found it to be fantastic as a freezer meal. Since I generally make enough for a family of six (apparently, I am incapable of cooking for one or two like a normal singleton. But it’s OK because I love leftovers.) I have got into the habit of splitting the mac n’ cheese into two casserole dishes and jamming one into my freezer for later. I made it a couple of months ago when the days were still crisp and cold. Then it warmed up and I wondered if people’s appetites for hearty, homemade macaroni and cheese had waned, so I kind of put it on the back burner (nyuk nyuk). And then we had another, delayed, blast of winter. Oh! I thought, a second chance! And then, uh, well, let’s just say I lost track of time. But I think this is a good recipe to have on hand. Although there is no official recipe. I, like my parents, kind of make it up as I go along each time depending on what I have lying around. 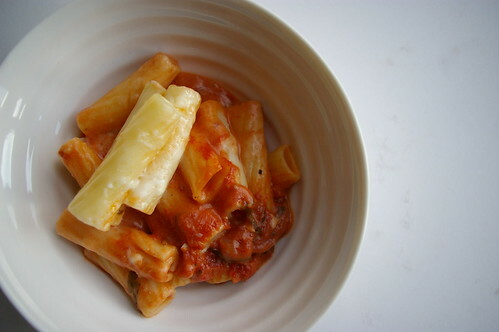 But, fundamentally, it is macaroni and cheese with tomato sauce on the bottom that is all baked together in a casserole dish with a layer of cheese on top. And it is far greater than the sum of its parts. Tomato sauce = good. Pasta doused in cheese sauce = good. That layer where the two mix = perfection. I like to take a couple of big spoonfuls and top with some cracked black pepper, then eat it with a spoon. But the real beauty of this is that it is infinitely adaptable. Don’t like the cheeses suggested? Use what you’ve got or what you like. Don’t have fresh herbs? Use a pinch of dried basil. 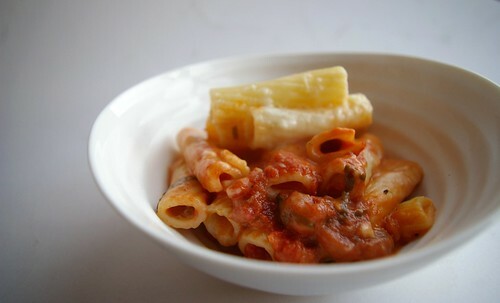 Use your family’s own secret tomato sauce recipe for that matter. This is about using what you’ve got and experimenting with what you think it will taste good. 1/4 cup basil (or combination of mostly basil and some parsley), roughly chopped. 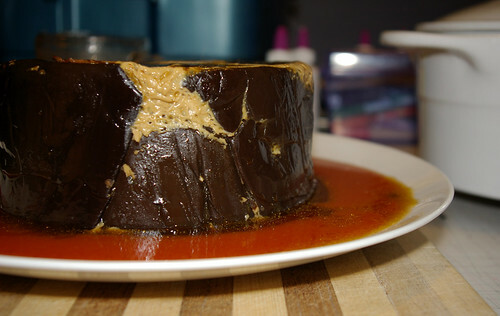 Heat oil in a pot over medium heat. When hot, add onion and saute until transluscent. Add garlic and stir for about a minute until fragrant. 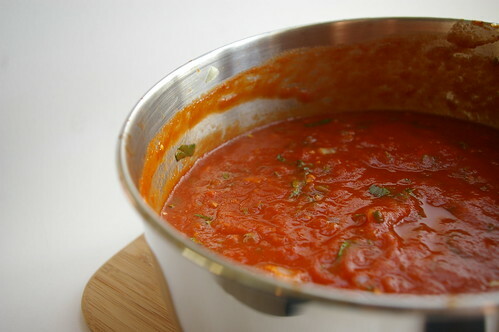 Using the can lid, drain the tomato liquid from the can of whole tomatoes into the pot. Let the liquid reduce by half and then add in the tomatoes. I dice them one by one in my palm using a basic dinner knife as I like small chunks of tomato. Another trick is to use kitchen scissors and just cut them up in the can. Add to the pot. Then add the crushed tomatoes. Stir in sugar and balsamic and let simmer until it has reduced and thickened. You don’t want it too thick because it will reduce further in the oven. Add salt and pepper to taste. Stir in herbs. Cook pasta according to package directions. As the pasta boils, start on the cheese sauce. Melt butter over medium-low heat in a pot. When frothy and bubbling, add flour and mix with a whisk until well blended. Continue cooking for a couple of minutes to cook out the raw flour taste. Slowly add milk, whisking constantly to prevent lumps. After it has thickened slightly, add 4 cups of the grated cheese. (I usually switch to a wooden or plastic spoon at this point.) Stir until melted, then add salt and pepper to taste. (If it is too thick, splash in a bit more milk.) Remove from heat. 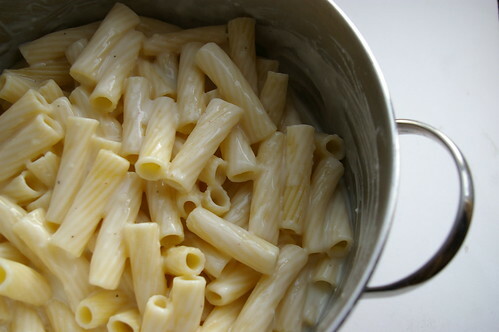 Drain cooked pasta and return to pot. Top with cheese sauce and mix together. Put tomato sauce in base of casserole dish. 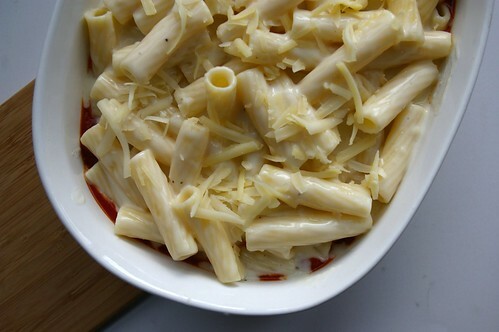 Top with macaroni and cheese and then sprinkle over remaining one cup of cheese. Bake covered for 45 minutes to an hour (depending on the size of your casserole dish). Remove lid and bake another 10 to 20 minutes until cheese is bubbling on top. This is fantastic with a nice green salad. Note: To make ahead, assemble the entire dish but stop just before baking it. Wrapped in plastic wrap and aluminum foil, this can be stored in the freezer. To cook later, let thaw and then bake as directed. I came into a plethora of eggs over the weekend. I was at work on Sunday when a colleague came up to me. Him: You like X, right? Him: Uh, OK. Well, I have some and I wondered if you wanted to buy some. Me: Wait, did you say eggs? Him: What did you think I said? Anyway, he had a few dozen from this totally organic, self-sustaining farm outside of Calgary called Thompson Small Farm. I’ve been searching for really good eggs since I moved here from Vancouver. I’ve found the ones here, even from area farms, to be pretty anemic looking and I’ve craved those with those golden-orange yolks that are so beautiful. So, the thought of finding those was enough to tempt me to buy two dozen. Plus, well, he said one of them was blue-green and that was just a bonus. 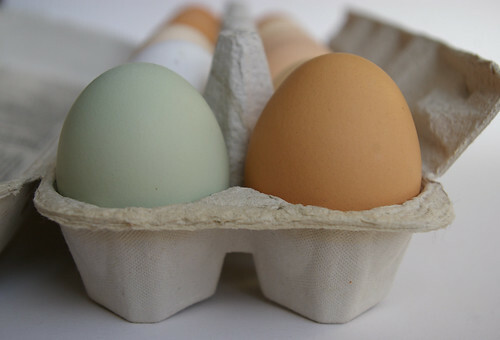 So, for the next two days I dreamed up things to make with these pretty eggs in their multicoloured shells. 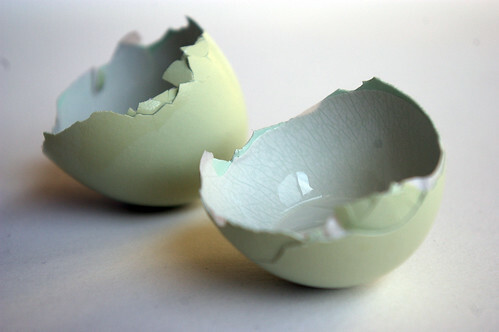 And I realized I wanted to do something that would really showcase the egg itself. 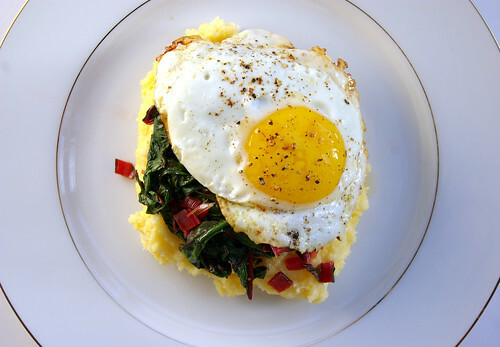 Somewhere in my food-related Internet travels, I came across a post where someone had topped polenta with cooked greens and a poached egg. Since I have come to love chard mostly owing to this, I thought it would be cool to do a riff on that idea. For the most part, I made this up as I went along, taking inspiration from the chickpeas and chard entry. But I did a lot of research on poaching eggs (vinegar, no vinegar, swirl, boiling water, stainless steel etc. Who knew there were so many variations? ), so that I would be fully prepared when it came time to make them. On the drive home, though, I realized I just wanted to do something fast and, in all honesty, I really didn’t want to dirty another dish. I figured frying the egg in the pan where I had just sautéed the chard would add even more flavour. I have about three different grinds of cornmeal as I keep thinking I have the wrong one for polenta. In the end, I used the instant stuff. What? It was in my cupboard already and I’m desperately trying to clear space. Plus, that stuff is INSTANT and that makes for a very, very quick dinner. I followed the instructions and then just doctored it up with a bit of cream (er, yes, well, it was already in the fridge . . . .) and some butter and a nice pinch of flaked salt. This was quick, easy and delicious. I loved the soft polenta, garlicky chard and the ever-so-slightly oozing egg yolk all combined into one. Maybe next time I will try poaching the eggs, but, in a pinch, this was just fine. I’d call these more guidelines than a recipe, so adjust as you see fit. Cook polenta according to directions, adding some butter/cream/salt/pepper/cheese or whatever else you desire. 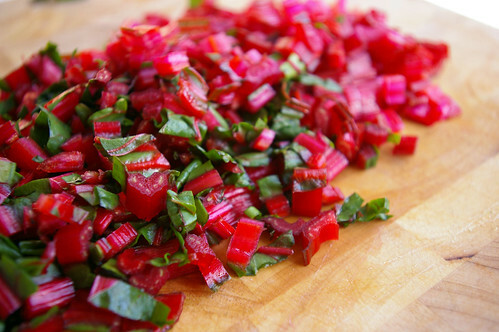 Remove the stems from the chard, then dice finely. Chop leaves into thin strips and set aside. In a large frying pan, heat up olive oil over medium heat. Add stems and a pinch of salt. Saute until they start to soften, about five minutes. Add the garlic and cook for about a minute, until it gets fragrant. 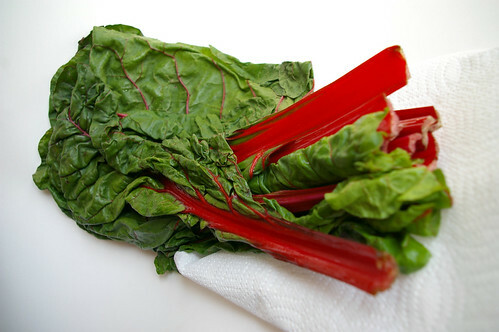 Add wine (or water or chicken stock) and then the strips of chard leaves. Stir, then top with a lid and cook for about five minutes until the leaves are wilted. Scrape out pan and add a small knob of butter to melt. 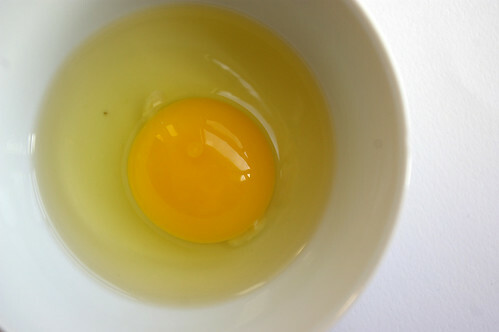 When bubbling add eggs and fry to desired doneness. 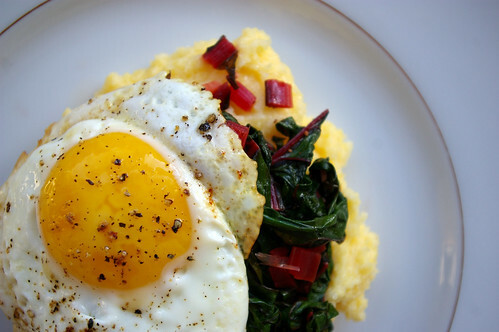 Dollop polenta onto plate, top with chard and fried egg. I eat one brussels sprout a year. It’s a family rule, though it punishes only me — the sole holdout in a family of sprout fanatics. With enough gravy to dunk the sprout in, I can power through the yearly ordeal. 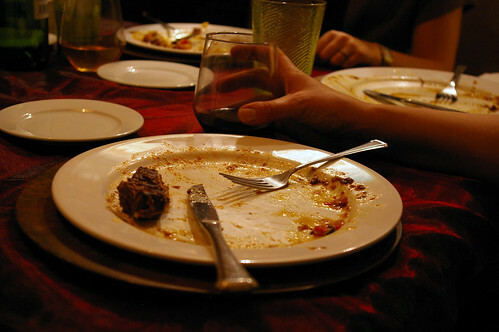 This year, however, no one seemed to notice that my plate remained sprout-free. But it made me think: was there a way I could learn to love my vegetable nemesis? The short answer is yes. 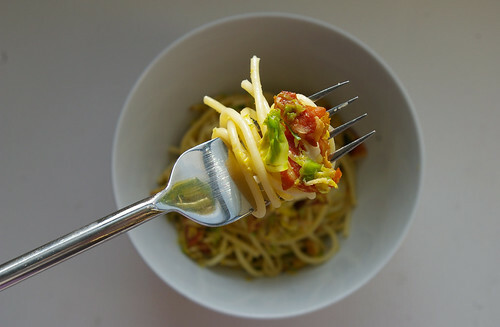 The longer answer is yes, and it involves spaghetti and bacon’s Italian cousin. 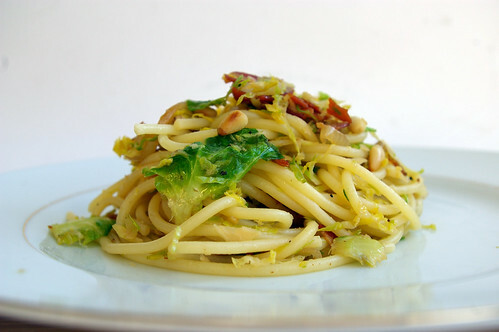 Behold, Pasta with Shaved Brussels Sprouts and Pancetta. Once I made the decision to try this recipe out, I made a shopping list. Somehow sprouts failed to make it onto the scrap of paper: it seems my subconscious couldn’t believe I really did want them. At the Italian deli where I bought my pancetta, I wasn’t paying enough attention either. I think the idea was to use a couple of thickish slices of the cured meat that could then be sliced into matchsticks. My slices were thinner than regular bacon, so I just chopped it into small pieces. Considering thinner slices meant better pancetta distribution, I didn’t really see a problem. I also didn’t notice the clerk was slicing up “hot” pancetta. But I kind of liked the kick of heat to this dish. 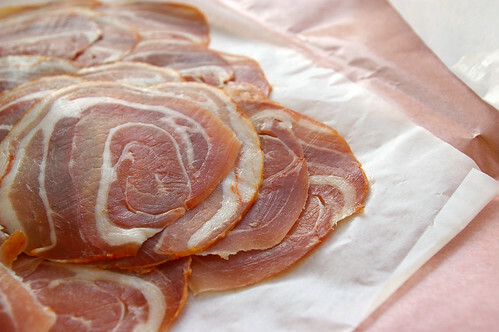 If you like a little spice and can find hot pancetta, I say go for it. Otherwise, if you still want some heat, you can probably add a pinch or two of red pepper flakes. The original recipe suggests using the slicing blade of a food processor to thinly slice the sprouts. 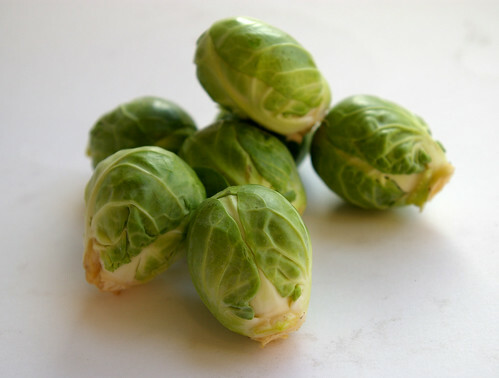 The photo on the web-site shows lovely green pieces of sprout. I ended up with vegetable confetti. If you’re looking for pretty, I’d suggest trying the mandoline route. Otherwise, the food processor is fine. While waiting for the spaghetti to finish cooking, I took a test bite of the sprout mix and couldn’t stop myself from eating more. Sure, any vegetable cooked with pancetta, pasta and pine nuts is probably going to be fantastic, but I really did enjoy the flavour of the sprouts. A quick saute with garlic and shallots, rounded out with just salt and pepper, brought a nice simplicity to the dish. And because the sprouts don’t cook for long, they were tender, not mushy. Perhaps this is the start of a whole new, sprout-loving me. Heat a large skillet over medium-high heat and add the olive oil. Add the pancetta and cook for about 5 to 6 minutes, until fairly crispy and cooked through. Clear some space in the middle of the pan and add the shallots. 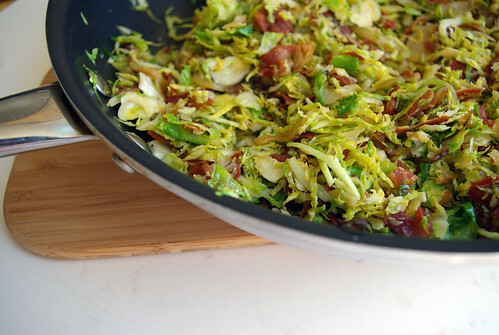 (If you don’t have enough room in your pan to create space, you can remove the pancetta with a slotted spoon and add it back in when you add the sprouts.) Cook for about 5 minutes, until the shallots are soft. Add the garlic and cook until fragrant, about 1 minute or so. While the shallots are cooking, add the pasta to the boiling water and cook until al dente. When the pasta is finished cooking, drain and add it to the skillet. You can add a splash of the pasta water (or more broth) if the mixture seems dry. 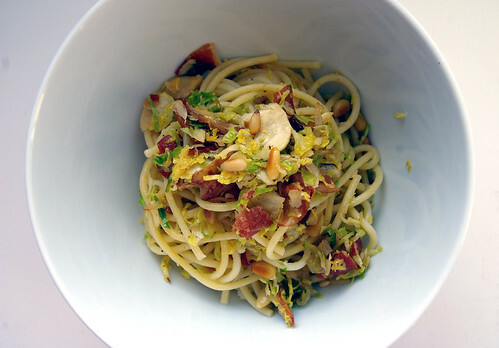 Add pine nuts, toss everything together, season to taste and serve. Serves 3 to 4. What do you get when you bring together four food bloggers and the idea to all cook something from Julia Child’s Mastering the Art of French Cooking? A helluva lot of delicious food and many full bellies. Not that any of us were complaining, that’s for sure. It was all Julie’s idea. In honour of the move Julie & Julia coming out, she invited over myself, Cheryl of Backseat Gourmet, Pierre of Kitchenscraps and Gail of The Pink Peppercorn, along with everyone’s significant others. Our only task was to bring one dish out of Child’s cookbook. Since I had to work that day, there seemed to be only one logical choice: a chilled soup. That way I could make it the day before and just let it sit in the fridge at work without doing any harm and no need to reheat. The fact that it turned out to be about -29C that day made my choice seem to be a bit ridiculous. 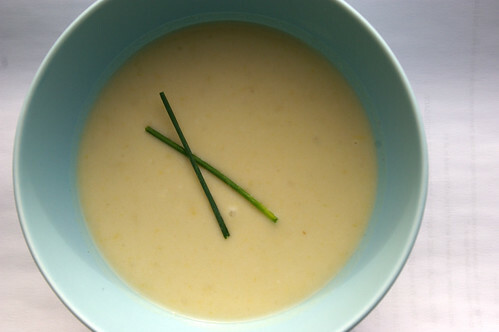 After all, who wants to eat cold soup when it’s stupidly freezing out? But, after a first course of delicious French cheeses and Julie’s homemade Raincoast Crisps (along with a glass or two of bubbly), we had all warmed up enough that it didn’t seem so bad. There is something a bit daunting too about cooking for other food lovers, particularly two who have cookbooks out and are serious players on the local (and beyond) food scene. But, I’m happy to say, this soup is stupidly good. And he’s not wrong. It was a rich, thick, creamy soup (I’m sure in no small part to the 3/4 cup of whipping cream that went into it!) that was intensely flavoured. I definitely could have eaten more the bowl I had, but I’m glad I didn’t because there was more courses to come. 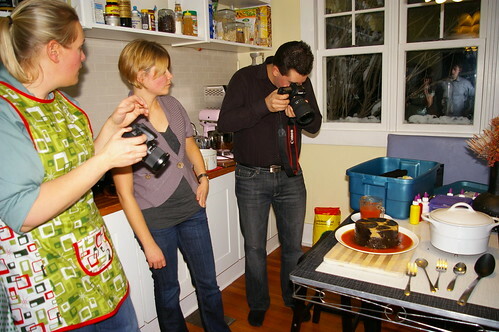 The other thing that happens when you bring together four food bloggers is that the actual eating doesn’t take place until after all the photographing. We were all jammed into Julie’s kitchen snapping away for a good 15 minutes or so; what the significant others were doing during that time, I know not. And it was a fine spread that needed to be documented. 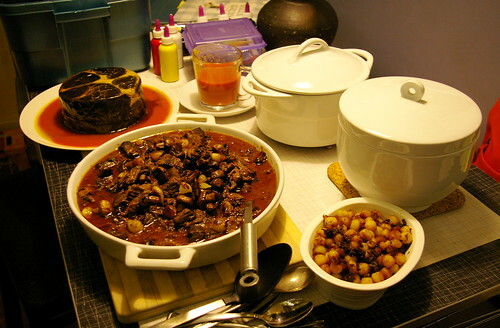 Boeuf Bourguignon with mashed potatoes, ratatouille, Pommes Parisien (read: cooked in delicous oil and butter) and a work-of-art Moussaka that had us all holding our breath as it was unmolded. The food was fantastic; I stuffed myself silly and felt like I needed to roll myself out to the car after. The next time we do one of these, I’m wearing stretchy pants. Most of all, though, it was great to meet some great new people and hang out with some old (as in known for longer, for the record) friends. 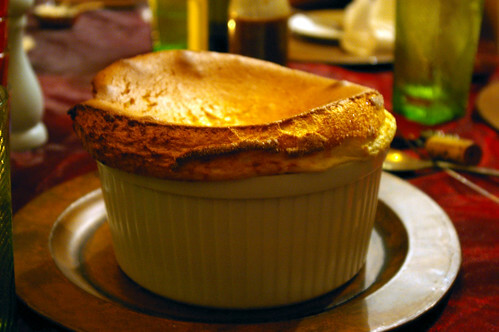 This is the original recipe from Julia Child’s Mastering the Art of French Cooking. Simmer the vegetables in stock for about 40 to 50 minutes until tender. Puree in a blender or through a food mill. Stir in the cream. Season to taste, oversalting very slightly as the salt loses savor in a cold dish. Chill. 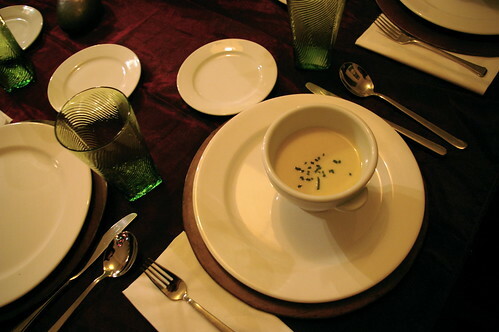 Serve in chilled soup cups and decorated wtih minced chives. The recipe says it serves 6 to 8. We stretched it to nine with no great effect. But, then again, we had about 10 other things to eat….